This private, peaceful home with a 1/2 acre wooded lot, offers the perfect balance of comfort, luxury and convenience for couples and small families. 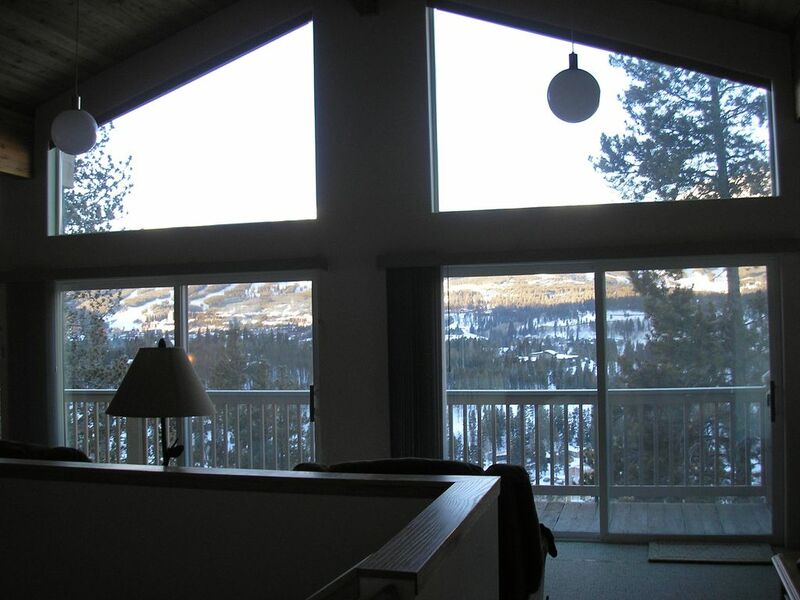 Guests enjoy close proximity to the center of town as well as the base of the Breckenridge Ski Resort . Convenient 2-car, heated garage, large, private hot tub under the stars, full laundry, excellent furnishings and superior beds provide you with all the comforts of home and none of the cares. Within 10-20 minutes driving time you can enjoy a variety of resort areas (including Keystone, Arapahoe, Vail, Beaver Creek and Copper Mountain). Hiking, biking, kayaking, boating and fishing are all available within minutes of the house. Relax in your over-sized recliners, while watching the sunset over the famous Breckenridge peaks, pick out your ski runs for tomorrow or plan your summer activities. The kitchen is fully equipped for all meals, large and small with everything from crock pot to rice cooker and fresh spices. Home furnishings are elegant but comfortable (enjoy sleep number king-size beds in master and second bedroom) and the bookshelves are stocked with plenty of videos, DVDs, games and books for your enjoyment. Enjoy all the comforts of home with none of the cares. Amenities: In our travels we have stayed in a variety of places with our children. The accommodations we've rented have run the gamut from economy to luxury. We've found everything we missed having while on vacation and put it into our new Breckenridge home for your enjoyment and ours. -Views of Peaks 5-10, town and valley. -Double-car Garage with Electric Door Opener. -Approximately 2100 square feet (perfect for two couples or a small family). BR B Activities: /B BR Skiing, sledding, ice skating, snowmobiling, sleigh rides, athletic center for swimming, yoga, track, basketball, racquet ball, Nordic skiing during winter months. Golfing, horseback riding, hiking, bicycling, boating, great resort activities for kids at the top of the mountain in summer and fall months. Terrific dining and activities offered in town. BR B Area: /B BR Two minutes from downtown Breckenridge and 5 minutes from the ski slopes. Approximately 70 miles from the Denver International Airport. Many great ski resorts within 20 minutes, including Beaver Creek, Vail, Copper Mountain, Keystone and Arapahoe Basin. I grew up in Colorado and spent my youth skiing in Breckenridge when it was just a small resort with one mountain. My husband (native of Hawaii) and I met while at Western State College in Gunnison Colorado. We've been married for 37 years, have two grown sons and know we are very lucky to finally have a beautiful retreat in Breckenridge. We visit 3 times a year for at least 2-3 weeks, which ensures that our house is very clean and well-maintained so that our guests will have a quality experience here. Breckenridge is a place with amazing choices in skiing, but it still retains the charm of the old mining days. We believe it is the best resort in all of North America. The Double Diamond house has the perfect location to enjoy all the area has to offer. It is close to town and yet offers an incredible solitude for the times you just want to escape the madding crowd! Views, views and more views! Southwestern exposure that offers lots of sun light while still enjoying the privacy of a wooded lot. Views from just about every room in the house and from the private hot tub. Every cent we make on the house goes back into it. Guests will enjoy brand new leather, reclining furniture, recently replaced carpeting, newly upgrade stove and oven, all appliances in excellent condition and terrific Sleep Number beds. Kitchen is well equipped and includes staples such as flour, sugar, rice, spices, and condiments (squeeze bottles only). We recommend checking the refrigerator before shopping for groceries. Last but not least, we have just installed a new and upgraded hot tub. The master bathroom has a separate sink and dressing area, as well as a custom built, spacious shower with tiled built-in bench. Granite countertops in master and second bathroom. Amazing views of the ski resort because the house is on a hill. Roads are paved and plowed regularly and do not require 4 wheel drive. Access to the house is very easy. Spectacular views of Peaks 5-10 at Breckenridge Ski Resort. You can sit in the living room or on the deck and select the runs you want to ski or board in winter, bird watch and enjoy the gorgeous foliage of spring, summer and fall. Radiant in-floor heating keeps air moister and temperatures well regulated. No blowers or noise associated with increasing and decreasing heat. 600 thread count linens and good quality towels provided. Down comforters on two king beds. HE Whirlpool Full size washer with gentle cycles. Well stocked for entertaining and setting a table for 6 people. 50' HD TV, 26' HD TV in all bedrooms. No cable in third bedroom but DVD player and many movies provided. 50' Flat Panel HD TV with 150 channels, HD cable box, including and easy to use channel guide. Flat panel HD TVs in 2 main bedrooms with DVD players. Take a book home if you haven't finished it. Leave one behind if you're done with it. We provide a few CDs and provide computer speakers that can be hooked to your laptop for your own i-tunes or music program. Ipod docking station, too. Our library is well-stocked with VCR and DVD movies for the whole family as well as great literature. This house does have stairs and is not handicap accessible. Large, 6-person tub on an expansive deck in the trees, with awesome views of the mountains. Clean and well-serviced tub. Great location, beautiful views, all the necessities in the house. Worth the price we paid and Buff was fantastic with communication.! Thank you very much. If there is anything we can do to improve your experience and warrant a five star we would be happy to hear from you. It is always our goal to ensure that our guests have great fun and have the comforts they need when choosing our home. We always appreciate constructive criticism in order to provide each guest an excellent experience. Thank you, again, for giving us a nice review and we'll hope to see you again in the future. Just as beautiful and comfortable as we knew it would be!! This is a wonderful review and thank you so much. You are great sports and thank you for being so cheerful the morning you had to live without electricity because a storm took down some lines in the area. It was fun to hear all of you being so excited despite the enormous amount of snow and lack of power when you called. You are the best and we are so happy you enjoyed everything. We'll hope to see you again sometime in the future. Have a great year. We enjoyed our stay 2/22-2/24/19. The kids skied all day then we relaxed, ate and warmed up in the hot tub. The views are beyond magnificent. A snowstorm hit while we were there and made it that much more special. A real Winter Wonderland. WE LOVED EVERY MINUTE! The house is beautiful. Well maintained. Well stocked kitchen with any appliance you may need. We will be coming back to CO in the Spring and hope to stay here, again. Thank you very much for taking time to share your experience and we are always happy to hear our guests enjoy the house and the area! We look forward to "seeing" you again in the future. We loved the house! The views of Breckinridge were stunning and the entire process of booking and check in/out were smooth and easy. Can’t wait to come back! Thank you very much for taking time to write and we are very happy that you enjoyed and wish to return in the future. Have a great year! Very convenient location, well set up, and comfortable house. The house is located in a quiet neighborhood a few minutes (driving) away from Main Street in an easily accessible street that allows you to avoid Main Street & Hwy 9 rush hour traffic when coming from (or going to) Frisco, a relevant issue during holidays and busy weekends. Westward views of the ski slopes and town are second o none, a luxury we enjoyed every day, and particularly during New Year Eve's celebrations (fireworks from Base Peak 8). The house works very well, the kitchen and laundry appliances, heating system, tv, internet, etc. work fine, with no issues whatsoever. In summary, it's a very conveniently located, comfortable and functional house, ideal for any group with either a sports or tourism related agenda. Thank you very much for a nice review. We are so happy to know you all loved the location and comforts as well as the terrific area. Hope to see you again in the future and have a terrific 2019! Beautiful house, beautiful view, perfect location. We loved this house. Nestled in the mountain, the view was stunning. The house was equipped with everything you need. It was immaculate and just 5 minutes from town and skiing. Favorite spot, drinking morning coffee on the balcony. Thank you so very much for taking time to review our house. We know how busy life gets after a vacation and greatly appreciate your efforts! Just 2 minutes from the center of Breckenridge town, which offers a wealth of activities throughout the year, including music festivals, ski fests, ice sculpting, and a large variety of outdoor activities for skiers, hikers, boaters, hunters, fishermen and sports enthusiasts. The surrounding area provides natural hot springs, museums, ghost towns of the old west, carriage rides and old fashioned hay rides. Rental revenues are refundable less a $100.00 cancellation fee if cancelation is received more than 30 days prior to arrival (**60 days during holiday periods.) Please contact us if you're traveling with more than 4 adults and wish to reserve our house.